The 2016 CANENA Annual General Meeting (AGM), “An Overview of the Standardization Process, Certification, Verification and Testing: Focus on Mexico,” was held in Mexico City in February. The roundtable panel forum “Electrical Reform in Mexico” allowed representatives from key institutions and other attendees to share, learn, and discuss the expectations arising from opening up the power generation market in Mexico to new providers. Building on the 2015 roundtable panel forum “What CANENA Really Means,” the executive committee held a workshop to improve CANENA’s vision and mission statement and provide recommendations for organizational improvement to membership effectiveness and responsiveness. The AGM included a visit to the Association of Standardization and Certification (ANCE), which was prefaced by a presentation by ANCE President Pablo Moreno. “ANCE: Background, Today, and Future” provided an overview of the association’s history and current activities. CANENA’s Mexico Vice President, Julián Yarza (director of standards, Hubbell Mexico) followed with a talk on the importance and advantages of ANCE standards as a tool for national regulations and the role of ANCE’s technical committee (CONANCE) in regulations development. AGM attendees had numerous opportunities to hear about greater technical standardization development from industry regulators, producers, and other key marketplace stakeholders and the usefulness of product certification requirements within respective national regulatory frameworks. The attendance of a broad cross-section of Latin American countries at this year’s AGM exemplifies the strong interest in realizing the benefits of participating with CANENA committees towards eventual adoption of harmonized standards. This year’s AGM was the first of three successive, related events, each of which will include visits to the standards development organizations (SDOs) of the host countries. These visits will support better understanding of similarities and differences between SDO processes for internal review and resolution of comments. These processes, along with the relevant committee and constituent comment review and resolution, lead to the continued successful publication of regionally harmonized standards that are consistent with existing electrical infrastructure and installation practices. In April, CANENA participated in a series of briefings at the Pan American Standards Council (COPANT) annual general assembly in Guayaquil, Ecuador. The 80 delegates and attendees there included European, Australian, and first-time, large Japanese contingents, and the briefings provided an overview of international, regional, and local efforts concerning standards and conformity assessment to foster international trade. Attendees received reports on emerging global developments such as systems approach, environmental stewardship, social responsibility, codes and standards, conformity assessment and product acceptance, intellectual property, and the impact of these developments. 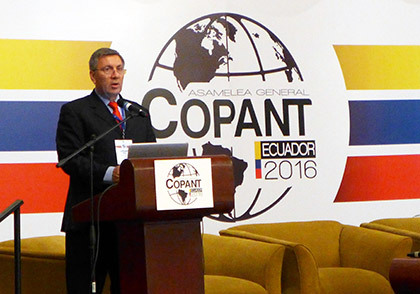 At COPANT’s general assembly in April, James E. Matthews III, vice president of the International Electrotechnical Commission (IEC), introduced a discussion of the IEC master plan, which evoked a spirited discourse. Developing countries, in taking steps to climb the economic ladder, have bought into the value of participating in IEC standards activities, resulting in a regional—and almost exclusive—preference for IEC standards as the basis for national adoption. Even so, most delegates strongly believe that their countries are unimportant to the IEC. They want to maintain their IEC-affiliated membership status indefinitely, which would allow access to IEC standards and continued participation, adoption, and promotion of IEC standards in return for lowering costly barriers to exports. The Technical Harmonization Committee (THC) chair and secretary are responsible for maintaining and soliciting membership to ensure readiness to fulfill its ongoing responsibilities as called for in the CANENA harmonization procedures. A key to managing the activity of the THC is establishing a revision cycle, which demonstrates to THC members and others that the committee has a continuous commitment to harmonization. Keep in mind that a three-year revision cycle usually equates to one year of relative dormancy by the THC. If there are no proposals, the cycle can simply be shifted to a period agreed upon and then reinitiated, so the benefit of establishing a revision cycle is that all members, including the participating standards development organization (SDO), can organize their time and resources and plan the flow of proposals to effectively revise a regionally harmonized standard. The 25th CANENA Annual Meeting will be held February 22 and 23, 2017, in Toronto, Ontario. CANENA is currently accepting nominations for the 2017 Tim McNeive Leadership Award, which honors a CANENA member in good standing who has provided great service to CANENA and the electrical industry. Nominations are due by August 15, 2016, to joel.solis@nema.org. Click here for more information. NEMA WC 26/EEMAC 201-2008 Binational Wire and Cable Packaging Standard covers uniform requirements for packaging electrical wire and cable for the North American wire and cable industry. It is available on the NEMA Standards Store for $89.